When it comes to a failure of Kingsley Dam, one can probably CAPITALIZE, boldface and underline the “unlikely” part of the phrase, but nevertheless, The Central Nebraska Public Power and Irrigation District is prepared. It HAS to be. Kingsley Dam impounds the largest body of water in Nebraska and its failure would be catastrophic by any measure, but if the dam failed when Lake McConaughy was full, the resulting flood would affect the Platte River Valley all the way to the Missouri River. To be clear, the chance of a dam failure is at the lower end of the “slim to none” scale, but because of the volume of water involved and the potential consequences downstream, nothing is left to chance. But Central is prepared for the “what if’s.” As Nebraskans in many of the state’s river basins have seen all too frequently in recent years, floods caused by excessive snowmelt runoff, precipitation events or a combination of factors are a fact of life. 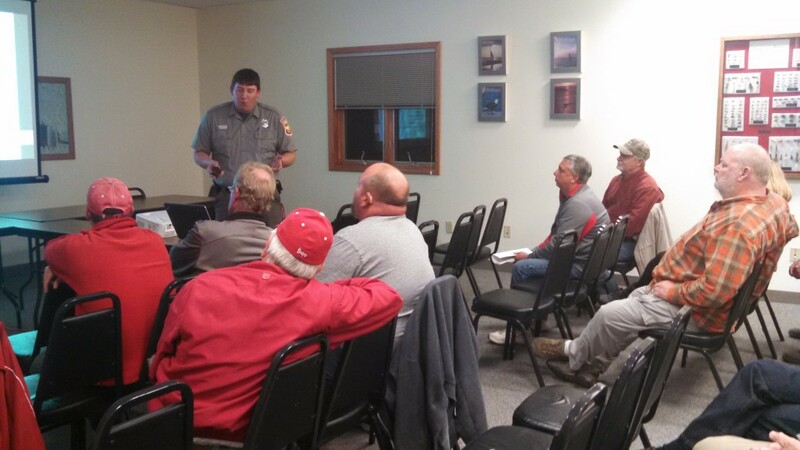 As part of that preparation, Central conducts a functional exercise of its Emergency Action Plan (EAP) for Kingsley Dam every five years. The object of the exercise is to coordinate with each local, county, state and federal agency on responses to such an emergency. In addition to refreshing each agency’s familiarity with their response plans, it also provides an opportunity for the agencies to provide input about how the response plans might be improved or updated. 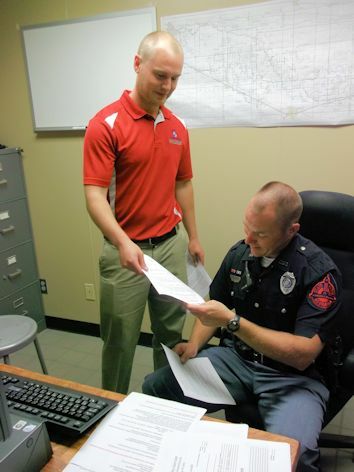 Central civil engineer Tyler Thulin, acting as a facilitator for the EAP, delivers a message to a member of the Nebraska State Patrol who was participating in the functional exercise. 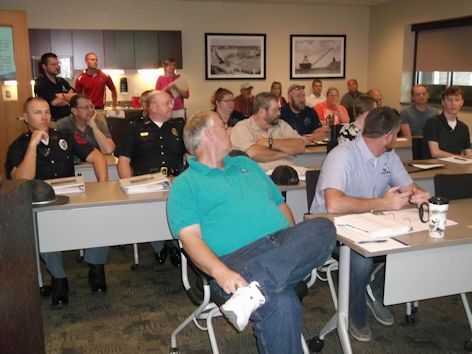 During Central’s recent functional exercise, representatives from about 13 different agencies first went through a “table top” exercise where each agency outlined their planned responses in the event of an emergency. The scenario was then set for the functional exercise, which involved extremely high inflows into an already full reservoir, capped by several successive days of strong winds pushing high waves onto the dam. To provide a little realism, Central enlisted the assistance of KNOP-TV in North Platte to produce short videos containing simulated emergency broadcasts using their own on-camera reporters relaying details about the dam failure. The “broadcasts” were shown to the participants to set the stage for the functional exercise. Participants were then dispersed throughout Central’s office in Gothenburg and the functional exercise was initiated, with messages among and between agencies flowing back and forth across the office phone system. “Facilitators” (Central employees) also helped the flow of information and communication by relaying “emergency messages” that required a response by a particular agency. For example, a message from a member of the public was given to the Nebraska State Patrol that reported a trapped motorist on a flooded road below the dam. 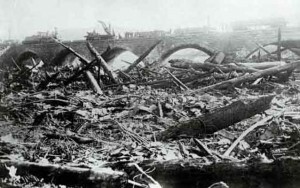 The patrolmen on site then had to decide how they would respond given the limited ability to travel below the dam and the constraints upon available manpower. The functional exercise simulates a dam failure or high-flow event in a stress-induced environment subject to time constraints on responses. It’s as close to reality as can be without actually mobilizing manpower and equipment. The exercise’s objectives include a determination of assets available from the various agencies, a test of how closely anticipated responses match reality, analysis of how the EAP can be improved, and providing an opportunity to improve cooperation among agencies. The next step – one that is hopefully never needed – would be implementation of responses to a dam breach or failure. The FERC requires Central to consider every potential angle that might contribute to an event, from a sudden “sunny day” failure that starts with little flow in the river below the dam to a failure that occurs when there are already high flows in the Platte River downstream. The National Weather Service has issued flood warnings for the middle of this week along the North Platte River above Lake McConaughy. Citing “heavy and prolonged rainfall” in the watershed the river drains in Wyoming, the warning indicates that flows in the river could reach 5,000 to 6,000 cubic feet per second (cfs) on Tuesday and above 8,000 cfs by Thursday in stretches of the river near Mitchell, Neb. Water is being released from Glendo Reservoir in Wyoming as it nears the flood pool. On Tuesday, the reservoir was at about 98 percent capacity. If the high flows materialize, the North Platte River above Lake McConaughy could reach a flood stage as high as 10.2 feet near Mitchell (flood stages vary at different locations due to channel width, depth and other factors), which would be near record highs. 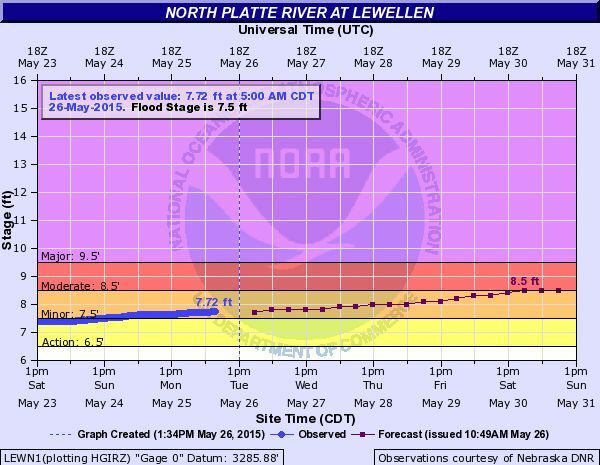 At the Lewellen gauge, which is just above Lake McConaughy, the river is projected to rise to a flood state of 8.5 feet by Saturday, which according to NWS data, would represent moderate flooding at and near the gauge site. Estimates of flow rates into the reservoir were not immediately available. However, high flows along the North Platte River below Lake McConaughy are not expected to be an issue. As of May 26, the reservoir’s elevation was 3,253.2 feet, which is about 12 feet below the maximum elevation of 3.265.0 feet. Inflows, although expected to rise this week, were at 3,500 cfs on Tuesday while outflows were around 300 cfs. In short, the reservoir has capacity to store the high inflows expected this week. At the same time, flows in the South Platte River are beginning to decline in Colorado, although more rain could alter that picture. 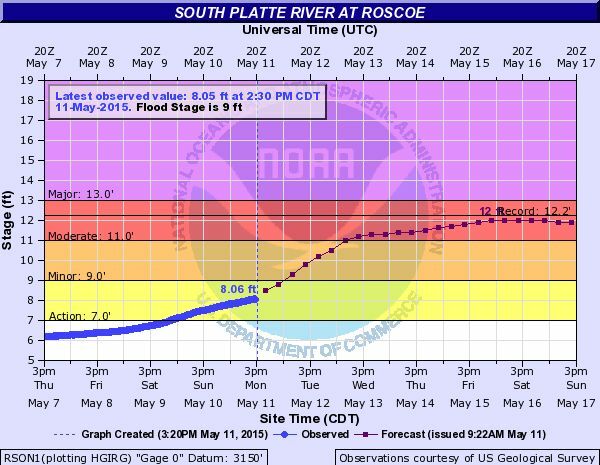 At the Roscoe and North Platte gauges in Nebraska, the South Platte is expected to reach a peak on Wednesday or Thursday before beginning to decline. 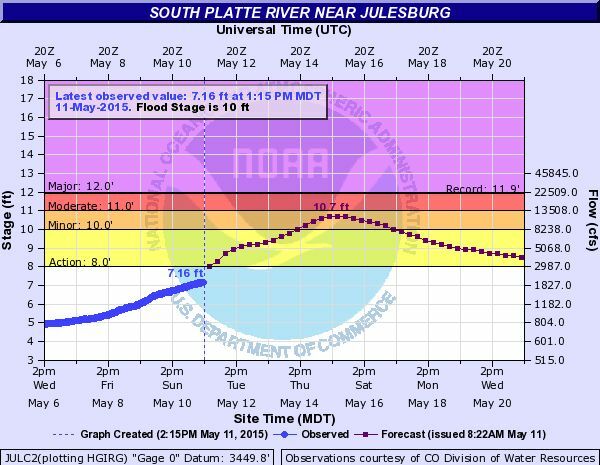 However, the South Platte is projected to continue to carry higher than normal flows for the next few weeks. Only minor lowland flooding is currently projected for the Platte River in central Nebraska. National Dam Safety Awareness Day occurs on May 31 of each year to commemorate the failure of the South Fork Dam in Johnstown, Pennsylvania in 1889. The dam failure resulted in the loss of more than 2,200 lives and is the worst dam failure in terms of fatalities in the history of the United States. National Dam Safety Awareness Day was created to encourage and promote individual and community responsibility for dam safety, as well as to provide information on what steps can be taken to prevent future catastrophic dam failures. A secondary goal is to promote the benefits dams offer to communities. For 30 years, the federal government has been working to protect Americans from dam failure through the National Dam Safety Program (NDSP). The NDSP, which is led by the Federal Emergency Management Agency (FEMA), is a partnership of the states, federal agencies, and other stakeholders to encourage individual and community responsibility for dam safety. While Kingsley Dam, which impounds the largest reservoir in Nebraska, is the primary focus of Central’s dam safety efforts, Central also has prepared emergency action plans for dams impounding Jeffrey Lake and Johnson Lake. The possibility that Kingsley Dam (or Jeffrey or Johnson dam) will fail is extremely remote, but Central would like the public to know that it is prepared in the event of an emergency that threatens the integrity of its dams. Central updates and revises each of its emergency action plans (EAP) annually and distributes the revised plan to a designated list of local, state and federal entities. The purpose of the EAPs is to provide maximum early warning to all persons downstream of the dam involved in the unlikely event of a failure (catastrophic or otherwise) of the structure. In addition to providing early warning, Central’s objective is to minimize or eliminate danger to people and property downstream. EAPs contain information pertaining to how potential conditions that could cause or signify an emergency situation and steps to follow to evaluate those conditions. Such conditions include inordinately high flows, adverse weather conditions, and any situations discovered during routine inspections of the structures. Central’s dams are inspected regularly by well-trained employees, annually by Federal Energy Regulatory Commission (FERC) personnel, and at five-year intervals by independent engineering consultants. 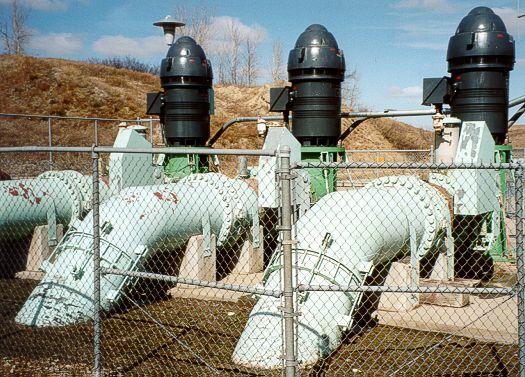 Central also conducts functional exercises of the EAPs every five years – as required by the FERC — that involve representatives from the numerous agencies that would be involved. A functional exercise for Kingsley Dam is scheduled to take place at Central’s Gothenburg Division headquarters on June 10. So you can rest easy tonight knowing that you probably don’t have to worry about failure of one of Central’s dams, but also that plans are in place to respond to such a calamity … just in case. Visit http://engineeringstrongersafer.net/ for more information on National Dam Safety Awareness Day. A small aquatic species, not much bigger than your thumbnail, poses a threat to Nebraska’s lakes, reservoirs and associated power-generating facilities. Once established, the critters are extremely difficult and expensive to remove. The creature is the zebra mussels (and their relative, the quagga mussel). But Nebraska is not without defenses. As the Memorial Day weekend — and the summer recreation season — approaches, boaters and recreation-seekers can help by simply cleaning, draining and drying a boat, trailer and related equipment to help prevent the invasion. The zebra mussel has caused enormous problems in other parts of the country and has been detected in Nebraska in a lake at Offutt Air Force Base and on a dock on the South Dakota side of Lewis & Clark Lake. Evidence of zebra mussels was also discovered on a boat and trailer at Harlan County Lake, although the specimens had died before the boat entered the water. Whether it spreads to other lakes and rivers depends to a large degree on the public’s vigilance. The mussels are one of many invasive species found in various lakes and rivers that can cause damage to boat motors and clog cooling water intakes at power plants. 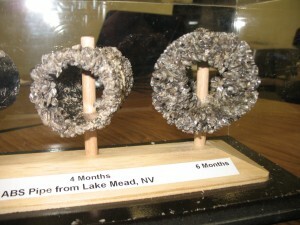 Pipes clogged by accumulation of quagga mussels. 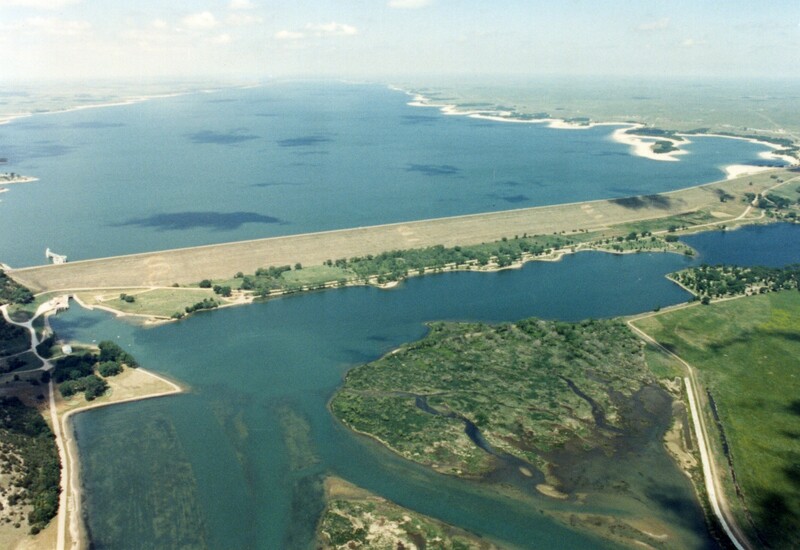 The Central Nebraska Public Power and Irrigation District uses water to generate electricity at the Kingsley Hydroplant at Lake McConaughy and also at three hydroplants along the Supply Canal between North Platte and Lexington. In addition, the Nebraska Public Power District uses water from Lake McConaughy to cool equipment at Gerald Gentleman Station near Sutherland, and to produce power at the North Platte Hydroelectric Plant. Preventing aquatic invasive species from fouling intake pipes and other equipment is important to continuing Nebraska’s ability to provide low cost, reliable electricity. “We’ve seen the devastation that zebra mussels have done to water bodies in other states,” said Central Senior Biologist Mark Peyton. “They dramatically change the fishery and natural balance of the lake or river. What’s more, when they are in a system like the Platte River, it would be next to impossible to prevent them from infesting all the other water bodies associated with that system. A freshwater mollusk native to eastern Europe and western Asia, the zebra mussel — so named for its striped shell — was first detected in North America in 1988 in Lake St. Clair, a small lake between Lake Huron and Lake Erie. The first specimens probably arrived in the ballast water of ships that sailed from a freshwater port in Europe. It has since spread throughout the Great lakes region and to river systems in the Midwest, including the Ohio, Illinois, Arkansas, and Mississippi rivers. How can such a small mollusk create such problems? First, they reproduce prolifically. A single female, which has a life span of up to five years, can lay more than a million eggs during a single spawning season. Second, the mussels anchor themselves to hard surfaces in huge numbers. Water intake pipes at factories, water treatment plants, and power plants have been clogged by the buildup of mussels, requiring difficult and expensive removal. Beyond industry, zebra mussels can infest boat hulls and motors, docks, lifts and any other structure in the water. The shells of dead mussels can accumulate in great quantities on swimming beaches, the sharp edges posing a threat to swimmers’ feet. In addition, because they feed by filtering algae and plankton from the water, they can disrupt the food chain at its base. A relative of the zebra mussel, the quagga mussel, has been discovered at Julesburg Reservoir in the South Platte Basin, less than 50 miles from Lake McConaughy. The quagga poses the same threat to industry and recreation as the zebra mussel and has been found in many western lakes. Nationwide, the economic impact of the mussels comes to billions of dollars. She said there would be no way to eradicate the mussels if they gained a foothold in Lake McConaughy. “We could only hope to contain them and even that would be expensive for Nebraska,” she said. At the root of the state’s effort to educate the public about the threat posed by the mussels is the slogan, “CLEAN. DRAIN. DRY.” Lake visitors are urged to clean, drain and dry any watercraft and recreational equipment before putting them into the water. Decker said it doesn’t take long to inspect boats. The more difficult task, she said, is simply making people aware of the need to do so and getting them to follow through with regular inspections. The public is the only line of defense and Nebraska needs help to repel the invader. For more information about the invasive mussels, visit the Nebraska Invasive Species Project’s web site at http://snr.unl.edu/invasives. In anticipation of flows in the Platte River being above target flows set by the U.S. Fish and Wildlife Service, Central’s board of directors met in a special board meeting on Fri., May 8 and approved (subject to legal review and approval by the other parties) agreements to divert excess river flows into the E65 Canal and Elwood Reservoir for groundwater recharge purposes and to augment instream flows. The agreements are part of efforts by Central, Tri-Basin Natural Resources District, the Nebraska Department of Natural Resources, the Nebraska Community Foundation, and the Platte River Recovery Implementation Program to utilize excess flows for beneficial purposes. The Central Nebraska Public Power and Irrigation District is in the process of partially filling Elwood Reservoir in preparation for the 2015 irrigation season. With irrigation customers limited to 12 inches/acre over the coming irrigation season, a completely full Elwood Reservoir will not be necessary. Instead, Central will divert 15,000 acre-feet of water into Elwood, raising the reservoir’s elevation to about 2,602 feet by the end of May. The normal maximum elevation is 2,607 feet. By limiting the amount of water pumped into the reservoir, Central will be able to conserve thousands of acre-feet in Lake McConaughy. 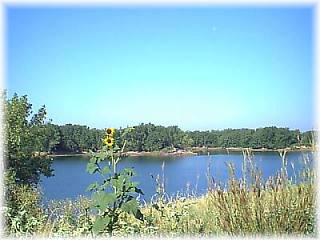 Central’s storage rights require that water pumped into Elwood Reservoir for irrigation purposes must be a transfer of storage water from Lake McConaughy. To accomplish the fill schedule, Central plans to operate two of the three pumps at the Carl T. Curtis Pump Station in April, and then use one pump during May to reach the intended level. The pumping process will raise the reservoir’s elevation by 14 feet between April 1 and the end of May. In addition to providing water for irrigation customers, inflows into the reservoir will benefit the fishery at the lake, as well as providing some incidental groundwater recharge benefits. Central, in cooperation with Tri-Basin NRD and the Nebraska Department of Natural Resources, had diverted 15,000 acre-feet into the reservoir for groundwater recharge last year – water that was in excess of target flows and other uses in the Platte River – and then added another 15,000 acre-feet for recharge purposes in December and January. Water that is pumped into the reservoir is allowed to seep into the ground, thereby helping the area’s groundwater level, as well as augmenting base flows in the Platte River as the water eventually moves underground back to the river. The following story was originally printed in the Gothenburg Times. DEPENDABLE DONORS: There are 16 employees at the Gothenburg office of Central Nebraska Public Power & Irrigation District that regularly donate blood to the American Red Cross. CNPP&ID allows employees to take an hour leave to give when the Bloodmobile comes to town. 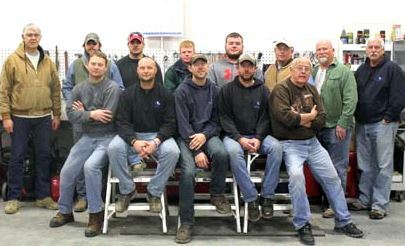 Givers include, l-r: Front—Jake Sitorius, Matt Ostergard, Mike Koubek, Jeramy Hendricks, Doug Viter; Back—Tom Holm, Blake Munster, Dustin Ehlers, Scott Peterson, Ethan Lambert, Scott Wolf, Lonnie Warner and Mark Peyton. Not pictured: Jon Herrick, Logan Ricley and Randy Walker. Because blood is pumped throughout the body from the heart, the donation of blood to someone in need can be likened to giving a gift from the heart. American Red Cross officials describe the giving of blood as a gift of life. Sixteen employees of Central Nebraska Public Power & Irrigation District see it that way too. Since each of them started giving blood, they have collectively donated 838 pints of blood when the Bloodmobile stops in Gothenburg. With about 60 people giving blood four times yearly, CNPP&ID contributions make up a fourth of the givers, said senior biologist Mark Peyton. Amanda Koubek, American Red Cross account manager, said an organization like Central that allows its employees to donate during work time is monumental to the success of the Gothenburg Community Blood Drive. “The patients that need life-saving blood products are grateful for their selfless donations over the years,” Koubek said. Doug Viter was 22 when he first gave blood. At the time, he was working at Central on a bridge crew. When he first started the job in 1966, other members of the bridge crew, like Lloyd Streeter, Elmer Dyer, Aaron Olson and Louis Trimble, encouraged Viter to give. He took their advice, donating blood for the first time in the former Gothenburg Times office which was where the present-day Sander Furniture and Gifts is located. Since Viter started giving, the canal superintendent has donated 123 pints of blood and is the longest-giving employee at Central’s Gothenburg office. Peyton noted that Viter strives to be the first donor, showing up at the Bloodmobile 20 minutes early. Viter added that after giving blood, he eats “the best” soup, sandwiches and cookies and visits with other donors. Lonnie Warner, who started out working on the bridge crew with Viter, is now a heavy equipment operator at Central. He first gave blood in 1977. Warner was a senior at Gothenburg High School when the Bloodmobile came to the school and set up their equipment in a hallway. The next year, he began working at Central and to date, has donated 140 pints. Donating blood helps other people. Warner missed a year of giving when he broke his leg but has given consistently before and after the accident. He added that he encourages the employees who work with him to donate blood. “I think it’s awesome that so many guys from Central do it,” Warner said. Central employees had the experience of helping a colleague 38 years ago when Leonard France had a bleeding ulcer. France, who was an electrical supervisor, now works part-time for district. When France needed 76 units of blood in 1977, Peyton said France was told he could pay for it or replace what he took. Central employees district wide took it upon themselves to give blood for their co-worker and donated five more pints than what France needed. Central’s newest employee, Dustin Ehlers, has given blood (four pints to date) for about a year. Last April, Ehlers said he was encouraged by Warner and told that giving blood helps others. 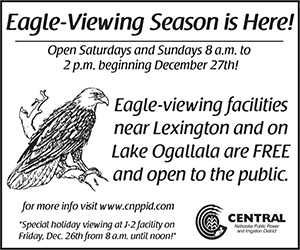 For further details, see our eagle info page here. Above normal flows in the South Platte River this fall has allowed Central to partner with Tri-Basin Natural Resource District and the Nebraska Department of Natural Resources to divert excess flows into the E-65 canal system and Elwood Reservoir for groundwater recharge. Agreements allow a total of 10,000 acre-feet of water total to be diverted into Central’s system of canals and lakes, allowing for Tri-Basin and the State of Nebraska to get credit for recharge in the Republican and Platte River basins. Diversions began on December 10, 2014, and so far approximately 6,500 a-f of water has been diverted. Elwood reservoir has risen five feet in elevation due to this project. 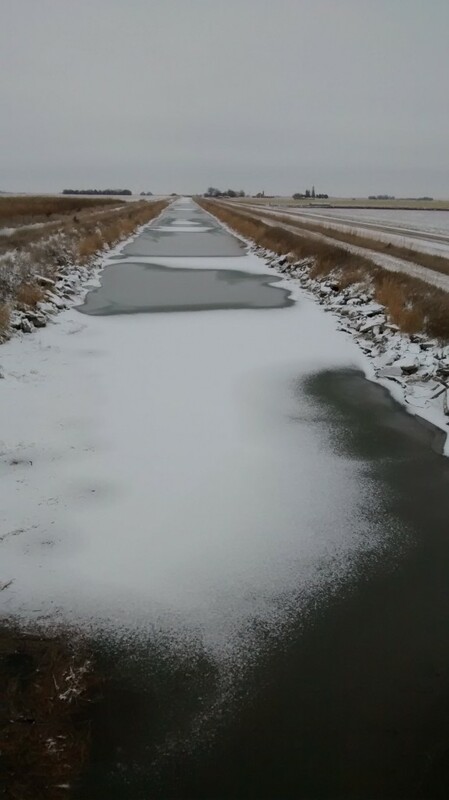 This photo shows icy water held in the E-65 canal system from miles 19.3 to 20.1, allowing for groundwater recharge from Johnson Lake to the area shown above near Smithfield.